Down Memory Lane features an "institution in the wonderful world of entertainment" - Royal American Shows, a rail show so large and extensive, it used two trains for transport. All Star Amusements played the Winnebago County Fair in Pecatonica, Illinois, and featured their newly imported After Burner. The Eastern States Exposition, more commonly referred to as "The Big E," is a regional fair for the six New England States. What do they offer and how do they keep visitors coming back each year? Crabtree Amusements participates in a number of events in Texas, not the least of which is the Travis County Livestock Show and Rodeo in Austin. G.G.W. and Wood Entertainment brought in a number of pieces to complement the extensive midway. The History of Train Shows continues with an overview of the Eyerly Aircraft Company of Salem Oregon, a company that segued into amusement rides and created such classics as the Octopus, Roll-O-Plane and Loop-O-Plane. The state trial for former North Carolina Commissioner of Agriculture Meg Scott Phipps has resulted in a guilty verdict on four of five charges. Travel Out and About with CARNIVAL on a midway visit with Georgia-based Drew Expositions at the Western North Carolina Fair. In the Concessions Section, meet Vernon Reiter and Reiter Enterprises, a company he created that offers flags, banners, food and concession apparel, aprons, and moneybags. Also in the Concessions section. The man who sizzles on the midway - T-Bone, a veteran games agent with a number of stories to tell. Manufacturer's Showcase introduces a new family ride from David Poythress of Fantasy Manufacturing, the Crazy Tugs. Do you remember the Allan Herschell Kiddie Jeep ride? This ride was another entry from the company that helped develop the concept of a kiddieland. The annual expanded Modeler's Corner features the efforts of a number of dedicated scale modelers from across the country. Learn how these individuals take tiny bits of plastic, paper, glue and paint and recreate a multi-million dollar entertainment business for considerably less. Standard magazine feature items include Midway Talk, Direct From the Lots and Classified Ads. The Exum name has long been associated with the carnival industry. Back in the early 1970s, Gerald Exum created and operated Sun Fun Shows. Take a look at the show in Down Memory Lane. The Jensen Beach (Florida) Pineapple Festival was a sweet date for Doolan Amusements and Alutok Rides. Peter R. and Stephen Kotula own and operate Alutok Rides and have a family history in the business. The outdoor amusement industry is mourning the passing of company patriarch Gerald Wisdom of Wisdom Industries, Ltd.
Ready to go and see what is happening in the industry? It is that time of year to pack the bags and visit the various trade shows. A calendar lists some of the upcoming events. The 2003 Industry Buyer's Guide Directory has hundreds of entries of companies looking to provide goods and services to the outdoor amusement industry. All relevant information regarding the company, including addresses, phone and fax numbers, emails and websites, and names of contacts have been included. While it may sound like an unusual combination, Strawberries and Blue Grass make for a tasty and profitable venture. Even without whipped cream, the Mighty Blue Grass Shows are a perennial favorite at the Florida Strawberry Festival. Contrary to popular belief, it is Tennessee that favors Blue Grass - the Mighty Blue Grass Shows that is. Talk a walk Down Memory Lane and visit Ken Penn Amusements/Nova Expositions. This Pennsylvania show had a long run as the midway provider at the West Virginia State Fair. Florida-based Myers International Midways, a carnival that divides into two units for most of their season, is profiled. The two units, which operate independently, carry about 23 rides each. Riders went up in the air and experienced the sensation of flying! Do You Remember takes a look back at the Flying Coaster, a ride that currently is making a comeback as a park model. Out and About takes a look at people and rides on Terry and Bill Bullis's Arbroo Shows. Looking for a place to roost in October? Check out the October route listings for dozens of carnivals. The chronological format makes this an easy to use guide. In the new Concessions section, Space Craft Manufacturing offers heavenly living while enduring the hardships of the road. Ken and Fran Freeborn are veteran concessionaires who operate several game units, including a long time favorite - a glass pitch. With the question as to which carnival would operate the midway at the 2003 North Carolina State Fair finally settled, it appears that New York State has entered the ring. The state has chosen not to exercise its option on a final year for Strates Shows. The bidding has been opened and the contenders are Strates Shows, Conklin/Powers and Amusements of America. 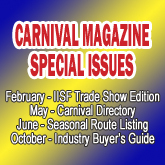 Regular features in CARNIVAL include Direct From the Lots, Midway Talk, Classified ads, and Modeler's Corner. A relative newcomer on the carnival scene is Alamo Amusements. Based out of San Antonio, Texas, the youthful owner is an energetic third generation showman. Tony Waldon is the railroad department official for Strates Shows and manages the show train. Tony handles a variety of other show duties but loves the train and the carnival. Good fortune has landed on the Geren Rides' midway as they pick up 15 dates from the bankruptcy auction of United Shows of America. Interstate Amusements plays the "other Florida State Fair." This date is in West Cocoa, Florida, and has a midway that rivals many a state fair. Down Memory Lane takes a long look at Lee's Rides, a 1950s-style carnival that made it all the way through the 20th century. North Carolina has been a hotbed of legal activity since an investigation was begun into the campaign finances of the former Department of Agriculture Commissioner. At least five people have faced charges. As the summer season winds down, the big question recently answered is "Who will play the North Carolina State Fair?" Four carnivals submitted bids for this prize event. The History of Train Shows follows the development of the Hennies Brothers Shows from a motorized carnival to a rail show. View some of CARNIVAL's Men of Letters. Photos of contributors who dutifully visit the various events around the country and submit materials to help satisfy that thirst for news and information are posted. At the Jefferson County Fair in Watertown, New York, Reithoffer Shows and Santillo Foods hosted a group of special youngsters for the third year in a row. Eli Bridge's newest addition is the SpiderMania. See what this exciting family attraction looks like going down the road. Manufacturer's Showcase offers the latest edition of Gold Medal Products online catalog; and for those events looking to book a thrill attraction, there is the BMX stunt team. The CONCESSION Section provides a profile of concessionaire Dennis Bossman, who owns and operates about a dozen game joints. Also featured is an overview of Bob's Space Racers, one of the most innovative game manufacturers to ever provide non-ride midway fun. Do you remember the B&H Amusement Rides Kiddie Bumper car? Mini Scooters offered thrills and bumps for the younger wanna-be drivers. Check out the classified ads for some great bargains! A Walk Down Memory Lane will bring back remembrances of Gooding's Million Dollar Midway. The creation of Floyd Gooding, the show evolved into one of the country's largest and had a route that included no less than four state fairs. The Wisconsin Valley Fair in Wausau, offered new and more new in 2002. A new grandstand and new rides from Farrow Shows were fair highlights. Farrow Shows also played the Mid South Fair in Memphis, Tennessee. One of the country's top 50 events, the fair has a lot to offer both on and off the midway. Al Stencell has penned another book dedicated to the American sideshow. Seeing is Believing - America's Sideshows provides information on a variety of backend midway attractions, along with a substantial number of photographs. Manufacturer's Showcase features the new dark ride from Owen Trailers, the Tomb of Doom; the new water game that made a big splash at IAAPA for Bob's Space Racers, Runnin' Waters; and a description of MAH Consulting and the services they provide to the outdoor amusement industry. Do you remember the B&B Amusement Rides Umbrellas Rides? Under a multi-colored top, a variety of vehicles offered the younger set a variety of grownup-style thrills. In the CONCESSIONS section, there is a profile of veteran game owner Alva Crouse, who operates the Great Racing Camels game. Also, a concession trailer built to last a century may come from Century Industries. Innovative ideas from the Indiana-based manufacturer include an all-aluminum body and rivet-free panels. The mess keeps getting messier as the North Carolina State Fair is without a carnival, as the new commissioner has revoked the contract signed by Amusements of America. In addition a judge has determined that the agreement signed with Drew Exposition for construction and operation of a chairlift ride at two locations in North Carolina, including one at the state fairgrounds, must be re-bid. In Texas there is Gary Denton who has been taking on the Alamo - Alamo Attractions that is. The San Antonio show owner was instrumental in broadening the base of carnivals in Texas with the introduction of Wade Shows. Powers Great American Midways has joined the ranks of the small number of U.S. carnivals that support a traveling school. The first students have been enrolled in the Great American Academy. Talk a walk out and about on the Carr Expositions lot. The History of Train Shows continues with the J. George Loos and his carnival, which served as a model for a number of other show owners including the Hennies Brothers, Orville Crafts and Frank Sutton. Plus, regular features in CARNIVAL - Direct From the Lots, Midway Talk, Modeler's Corner, and Classified ads. The 2003 CARNIVAL Route Listing is an annual listing of dozens of the country's finest shows. Find out who will be where when with this guide. This great resource, in an easy to use chronological format, makes booking with a show, or even booking a show much simpler. This handy guide is a terrific reference that will be used all year. Take a walk Down Memory Lane with McBride Bros. Amusements. Brothers Bob and Woody McBride launched the show in 1970. After what seems to be a very long time, it is no longer just a dream - the building designed to house the IISF Museum in Gibsonton, Florida is up. This is the third phase of a five-phase project designed to provide a permanent home to carnival memorabilia and artifacts. Ray Cammack Shows has promoted a carnival midway that is kinder, simpler and funner. It participated in the 80th edition of the L.A. County Fair. The show also played the 2003 Houston Livestock Show and Rodeo, where their La Grande Wheel was set up. Another date on the Ray Cammack schedule was the 2002 Orange County Fair and the show achieved a record gross at the event of $3.4 million. Do you remember Chance Rides Falling Star? This pendulum-style ride was set up on three trailers and weighed in at a hefty 183,000 pounds. In the new Concessions section - a magazine within a magazine - independent concessionaires Louis and Shirley Harvell and their Pronto Pups concessions are profiled. Also presented in this section is an overview of one of the industry's leading trailer manufacturers, Schantz and Sons. Learn more about the company that pioneered the retractable wheel design for concession trailers and other sit-on-the-ground units. Manufacturer's Showcase highlights Gold Medal Products and their new catalog, geared for maximizing profits; and Classic Creations Mini Midway on Wheels, the compact answer to providing a variety of games on one easy to move trailer. Also in the magazine are monthly features including Direct From the Lots, Midway Talk, Modeler's Corner, and Classified Ads. NEW in CARNIVAL is a monthly section targeting Concessions, Concessionaires and those who provide goods and services for this aspect of the outdoor amusement industry. This month features a profile of Hitch-Hiker Manufacturing. Gone are the days of the plain canvas and wood stick joints, trailer mounted units are now the norm, with bright colors and oversized graphics. Also in this section, the New York Showpeoples Association held a before-we-get-on-the-road meeting in Syracuse. There was a bounty of carnivals in San Antonio, Texas, among them Crabtree Amusements and Alamo Attractions. The Texas Folklife Festival and Alamo Amusements combined for an annual cultural event that was fun for all. A strong and long alliance has proven beneficial to both Reithoffer Shows and the York (Pennsylvania) Interstate Fair. Attractions booked at fairs frequently entail animal acts. One relatively new group traveling the highways and byways of the country and appearing on the midway scene is the Garretson Family of Tigers. The attraction booked most of its 2002 route with 20th Century Independent Midways. Do you remember spotlights the Childress Manufacturing Company's Kiddie Swing Ride and Kiddie Flying Saucer Ride. Cole Shows has reinvested the success of last year's season into this year's show. R.C. and Betsey Cole are planning for an even bigger return this year. Manufacturer's Showcase features the Rodot Lemon Squeezer from Rodot Enterprises; and the Sno-King Ice Shaver from Gold Medal Products. CARNIVAL magazine's 2003 Carnival Listing, a directory of hundreds of large, medium and small carnivals doing business in North America. The directory includes contact names, addresses, and other pertinent information. A great booking guide for any size event. Murphy Bros. Exposition has taken on Florida at the start of the 2003 season. Find out what innovative ideas have been implemented on this large show's midway. Also, review some of the dates that the show played during its 2002 season. In central New York, a relatively new carnival, Playland Amusements, has created quite a splash. In only a few short years, Joe Sofo Jr. and his wife, Roberta, have built not only a burgeoning midway, but also created a successful route. Take a Walk Down Memory Lane with the Deggeller Amusement Company. The show was founded by Allen and Irvin Deggeller and preceded the current Deggeller Attractions. Out and About makes a visit to the Strates Shows' lot, snapping photos of people and rides. Do You Remember Chance Manufacturing's Olympic Bobs? In the mid-'70s, this bobsled-style ride could be purchased for less than $115,000. There is still some controversy surrounding the North Carolina State Fair. Two individuals who were involved in the campaign for Commissioner of Agriculture have been arrested on federal charges. On another track, an investigation is underway over the awarding of a contract for a chairlift ride being erected at the fairgrounds. The History of Train Shows focuses on Al Wagner and Cavalcade of Amusements in the 1940s and '50s. Bright colors play a major role on every carnival midway. Colorful scenes from several shows offer prime examples of this. Manufacturer's Showcase spotlights a ride financing arrangement offered by Sellner Manufacturing; introduces a new ride for the 2003 season from Netherlands-based Mondial Rides, the Shock; and previews some new accessories from Concessions Manufacturing for their kettle corn operations. The Minnesota State Fair has had great success with their Independent Mighty Midway. Who was there and what did they bring? Take a walk Down Memory Lane with Stine Shows (Stine Amusements) predecessor to the current Smokey Mountain Amusements. Hailing from the Lone Star State, Kenny's Funland is a 29-ride show owned by the Maple family. + Sellner Manufacturing highlights their newest entry to the spin ride family - Martian Madness. The International Independent Showmen's Foundation (IISF) Trade Show proved to be an interesting and fun event with hundreds of exhibitors ;and a variety of social functions and meetings, something for everyone. Meet some of the friendly showpeople Out and About on the Belle City Amusements lot in Aiken, South Carolina. Direct From the Lots features exhibitors at the Gibtown trade show. It was 99 years and counting for the Florida State Fair. New rides, new attractions and procedural innovations marked this grand annual event. Norton Auctioneers brought the gavel done on an industry auction that was punctuated with low prices on a variety of used equipment. The History of Train Shows follows Cavalcade of Amusements through a season in the Midwest. It also highlights one of the primary attractions- girl shows. Do you remember focuses on the 40-feet high Garbrick Spinner. Other featured departments include Midway Talk, Modeler's Corner, and Classified Ads. Jake Inners - owner of Majestic Midways- is another branch on the Inners Amusements tree. He is part of a family that for several generations has worked to provide fun and entertainment on American midways. Wade Shows covers a lot of miles in the course of a season. Visit with the show at two dates in Texas and at the Central Florida Fair. It was a peaceful meeting of North and South - North and South Carolina that is, at their annual fair association meeting. Weather impacted the New York Fair Association meeting - but did not prevent them from conducting business and also having a good time. Do You Remember the Garbrick Merry Mixer? Manufacturers Showcase highlights one of the newest offerings from Hitch-Hiker Mfg. and some of the new options the company has available. Sellner Manufacturing has introduced the Star Command, space ships featuring new fun and thrills. In addition, there are regular features including Direct From the Lots, Midway Talk, Modelers Corner and Classified ads. Manufacturer's Showcase highlights the hundreds of exhibitors at the 2003 IISF Trade Show and Extravaganza. A complete listing of exhibitor information, including booth spaces, is included. One of the carnival world's patriarchs, Pat Reithoffer Jr., reminisces about growing up as the third generation of his family to enter the world of rides and attractions. Down Memory Lane features Royal Amusements, owned by Jack and Mayo Royal. Amusements of America, which played the North Carolina State Fair for the first.time, remained calm amid the controversy over their signing. Innovations and changes were the order of the day. After Hours Fun on the Thebault-Blomsness Midway meant big bucks for OABA, as several fund raising activities, including a pie throwing auction, made the jamboree the most successful for the organization for five years running. Do you remember the Chance Manufacturing, Inc. Space Shuttle? Get reacquainted with this pendulum ride, one of the amusement ride industry's entries designed to tantalize the public's fascination with the space age. The History of Train Shows (Part XXXVII), covers Charlie Sparks and the Sparks Circus and Al Wagner and Cavalcade of Amusements. Plus, monthly features Direct From the Lots, Midway Talk, and Classified ads. Coming in April - a review of the 2003 IISF Trade Show and Extravaganza - find out what is new and hot for the industry for the 2003 season. A visit with the two Ohio-based Bates brothers who joined forces to bring their respective midways to the Canfield (Ohio) fair. Plus an interview with Kim Bates Bozich, daughter of Geary Bates, who makes her livelihood in the business. A primary goal on the Powers Great American Midways is to please the public, and in order to do this, they have implemented a number of customer-friendly features. A brief profile of Wiley Irwin, Powers Great American Midways' office manager. Travel Out and About on Powers Great American Midways, see some of their rides and attractions, and meet some of the employees and staff. What was new for Deggeller Attractions in 2002? Plus a sidebar also highlights Walter House and his Hi-Roller. Manufacturer's Showcase highlights industry printer Spotlight Graphics, a company dedicated to meeting the needs of the outdoor amusement industry. Do you remember the Huss Ranger? This hefty German ride weighed in at 65 tons. The history of Train Shows (Pt. 36) covers the Seattle World's Fair, the Century 21 for Fun fun house and the founding of the rail show Cavalcade of Amusements. Plus regular features including Midway Talk, Direct From the Lots, and Modeler's Corner. Coming in February - IISF Trade Show & Extravaganza Exhibitor's Listing: who will be there, what will they be exhibiting, where on the grounds will they be.